I did have an issue opening the .pcap with wireshark. The error I am seeing: "The file "dvrminer.pcap" isn't a capture file in a format Wireshark understands." Quoting thlnk3r: This was an interesting read. Thank you for sharing. 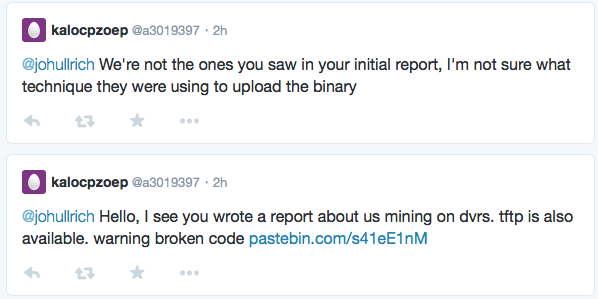 The correct link is https://isc.sans.edu/diaryimages/dvrminer.pcap - and it should be fixed above as well now. Think I already know the answer to this, but the DVR is not using UPnP or something to actively open port 23 itself, you had to manually do this, correct? I can't imagine too many home networks where the DVR is publicly remotely accessible on its default port.